Monday - The week continued the heat wave that started at the tail end of the last week. Due to my sun burn I decided to miss five-a-side as I was struggling to stand still, let alone walk or run. It was fortunate that I planned to give football a miss, as my train was delayed and I would have missed a good chunk of the game. When I got into my house I went straight upstairs to just lie down and give my body a bit of a rest until Nikki and my little boy got in. After playing a bit with my son, Nikki put him to bed and we watched YouTube before heading to bed ourselves. Tuesday - Unintentionally we had a very early morning as my son woke at 02:30 saying he wasn't sleepy. I appreciate that he didn't want to sleep, but I know me and Nikki did! I know they say don't negotiate with terrorists, but being tired and looking at his little face meant I did bribe him into going back to sleep, thankfully through to our normal wake up time. Other than that not much else to report. Wednesday - Nikki and our son had started to watch 'The Lego Batman Movie' (2017) earlier in the day, so we watched the last half an hour of the film when we all got home. Nikki had warned me that our son didn't like it when Batman wasn't on screen, but it didn't prepare me for the end of the film... as the credits started to role, it became very apparent that he was tired 😉. After we calmed him down he went to bed and we watched some episodes of 'Bones' whilst we had our dinner. Thursday - Not much to report, other than we had a disturbed nights sleep, as my son kept waking and needed to be comforted back to sleep. Friday - An early(ish) finish at work to head home and spend time with my son. We then spent the evening with my parents whilst they helped look after my son and helped Nikki with her NVQ. Saturday - To be honest we deliberated the day away and before we knew it, it was 15:00 and we still hadn't really decided what to do. 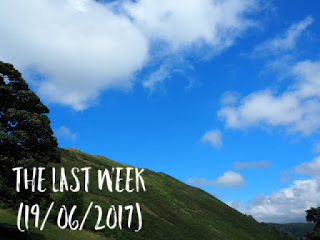 We ended up going to Carding Mill Valley to get out of the house and have an ice cream. Although there was a queue, it was really nice to get out and enjoy the sunshine. Sunday - We spent the day with Nikki's parents, watching the Azerbaijani Grand Prix after lunch.